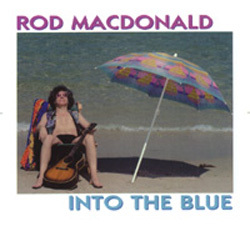 Gadfly Records is proud to release "Into The Blue," a new all-original collection of songs from modern-day troubadour Rod MacDonald. The new album is MacDonald's first CD since his early 1997 release "And Then He Woke Up." It features more of his trademark touches of insight and humor -- both the political and the personal. Anyone who has seen Rod perform knows that it's hard to mistake him for anyone else. One of the leaders of the folk revival of the '80s, Rod MacDonald has been a major force among singer/songwriters since being one of the primary organizers of the Greenwich Village scene (Rod founded the Greenwich Village Folk Festival in 1987). Two critically-acclaimed releases in the 1980s ("No Commercial Traffic" and "White Buffalo") led to continuous touring. In the early 1990s, Rod released "Highway to Nowhere" and "The Man on the Ledge," which was followed by "And Then He Woke Up" (1997).